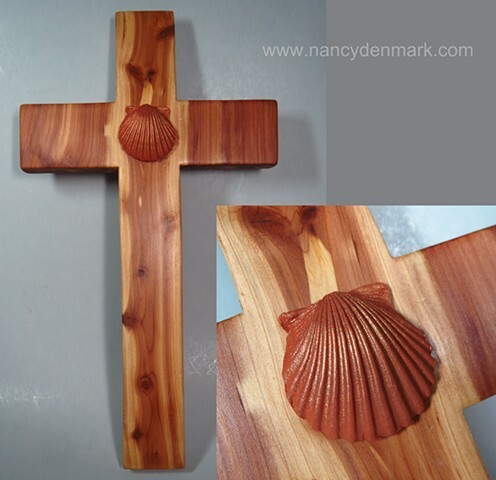 The sea shell, especially the scallop shell, is the symbol of Baptism, and is found frequently on Baptismal fonts. The dish used by priests to pour water over the head in Baptism is often scallop-shaped. According to a guide to ancient symbols, John is often depicted baptizing Christ with water poured from a scallop shell. The scallop is also a symbol for the Apostle James the Greater. St. James used the scallop shell during his pilgrimage to beg for food and water. Even the poorest people could fill the small shell, so he always found help along his way. Later, followers of St. James wore the scallop-shell symbol on their hats and clothes and it became the symbol of pilgrimage.